A few minutes before I began writing this, I was reading an article in the LA Times (online) about an Australian scientist who believes he's discovered why moondust is sticky (has to do with ultraviolet rays). 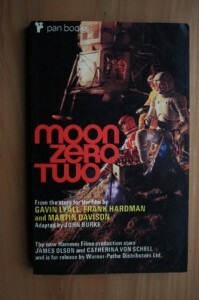 That dredged up the memory of reading this book when but a young lad still toying with the idea of being an astronomer. I don't know where I picked up this gem (a novelization of the movie of the same name) but I remember reading it several times. What most entranced me about the setting was that the protagonist operated a beat up, old spacecraft that traded in salvage. I don't know, at the time it sounded really cool, and inspired me to build I-don't-know-how-many "beat up, old spacecraft" with my LEGOs (the classic blocks, not the new fangled ones). By rights it should be a two-star review (if that) but, as is often the case with these older reads, it holds a sentimental place in my memory banks.